Non-chemical highlights are fantastic way to accessorize your hair. Unlike traditional highlights that are done with foils, having your hair color done this way will thicken your hair. It is very common to automatically associate “hair extensions” with only long hair, however there are so many other uses than the obvious. Over the last 10 years, I have experienced being a hair color educator and working with “coloring the hair with extensions”. 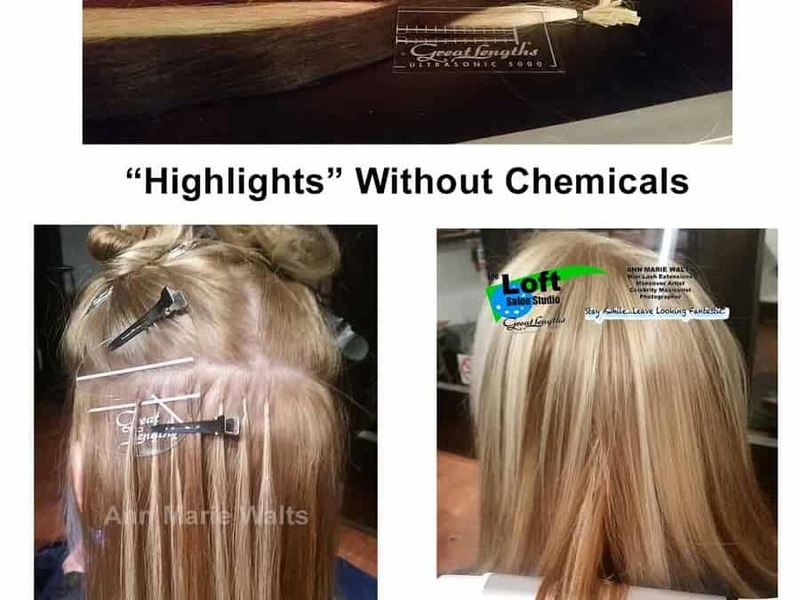 I have to be honest with you that when I went to a hair extension training that had introduced the idea of hair extensions being less “damaging” than chemical hair color I was put off a bit first, but very intrigued. Partially due to the fact that I was still educating for Redken. It was my job, at the time, to “eat, breath and sleep hair color”….ha ha. 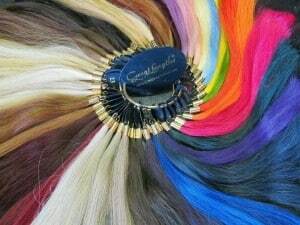 Now, it is a great thing to be offer both types of “hair color”. The hair color trends have really been bold, lately, and just about anything goes. However…….”anything goes” is sometimes the “chemical hair color” right down the drain, sometimes. Why is it that hair color fades, and especially the bolder hair colors? It is because of the chemical composition and the sizes of the dye molecules. Red dye molecules are the largest to fit into the hair strand. The “why” could lend itself to a whole science based post of how hair color works, and that will be saved for another time. In the case of Great Lengths Hair Extensions, I had the opportunity to actual go to the factory in Nepi, Italy to see how the hair is processed and handled. The handcrafted way that they “hand dye” the hair is absolutely incredible. They use a dyeing process that is much like how cashmere sweaters are dyed. Textile dye colorants are very durable. If you like very bold hair color or a stronger contrast, then I professionally would recommend that you opt for hair extensions over traditional hair color. Non-Chemical Highlights with thicken your hair. Professionally speaking, it was this professional benefit that did “win me over” as a professional corrective hair color specialist, to realize that traditional foil highlights had their limitations. Do you get “highlights” because it give your hair more volume? Do you get “highlights” because it makes your hair less flat? Do you get your “highlights” every 6 to 8 weeks? When you get your “non-chemical highlights” they will last up to 5 months.